Betmar-Heliand LLC, in association with the Oklahoma Film + Music Office (OF+MO), is pleased to announce production is underway on the upcoming feature film “Climate of the Hunter” in Oklahoma. Directed by Mickey Reece, “Climate of the Hunter” is a visual interpretation of The Jesus and Mary Chain’s 1985 debut album, “Psychocandy”, under the guise of two sisters and their battle for the affection of a man who may or may not be Dracula. The film, which is utilizing the Oklahoma Film Enhancement Rebate Program administered by OF+MO, began principal photography in Welling, Oklahoma on January 26, 2019. The feature film marks Reece’s 25th feature film as director. The script was written by Mickey Reece and John Selvidge, the latter of whom co-wrote the script for Reece’s “T-Rex” (2014) and “Suedehead” (2015). Producers of the film include Mikey Bill Taylor, Ron Sutor, Beth Alonso, George Adams and Jacob Ryan Snovel. The film will feature an all-Oklahoma cast and crew, including cinematographer Samuel Calvin, who describes the visual approach of the film as similar to the classic independent film and personal favorite “Boondock Saints”. 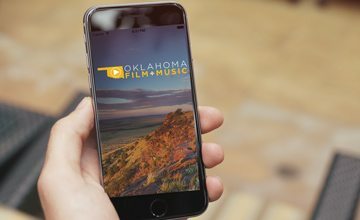 Created in 1979, the Oklahoma Film + Music Office (OF+MO) strives to share all that Oklahoma has to offer by welcoming filmmakers and music professionals to the state and by creating a network of support to develop Oklahoma film and music industries. For more information about the Oklahoma Film Enhancement Rebate Program or the Oklahoma Film +Music Office, please visit okfilmmusic.org. Behind-the-scenes photo provided by production.